MasterClub are a new manufacturer for me to purchase from. 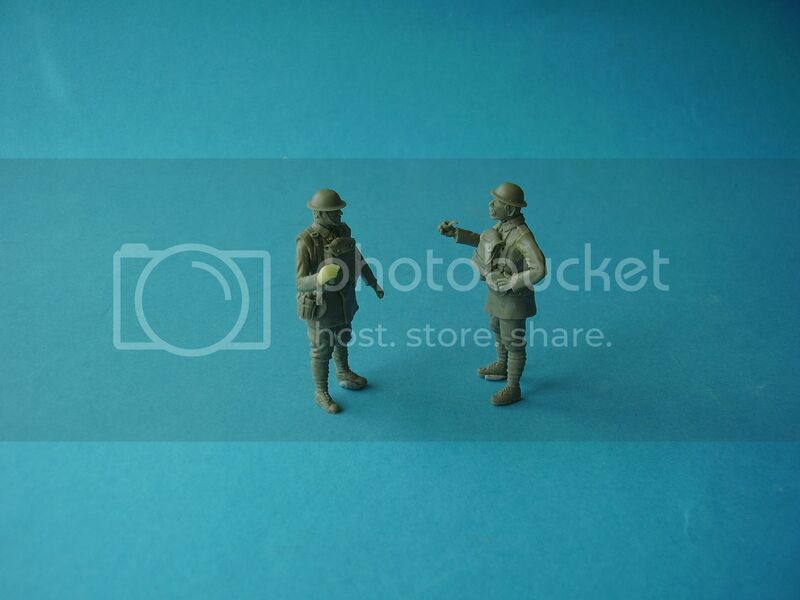 This is a look at their only two WW1 British Figures. 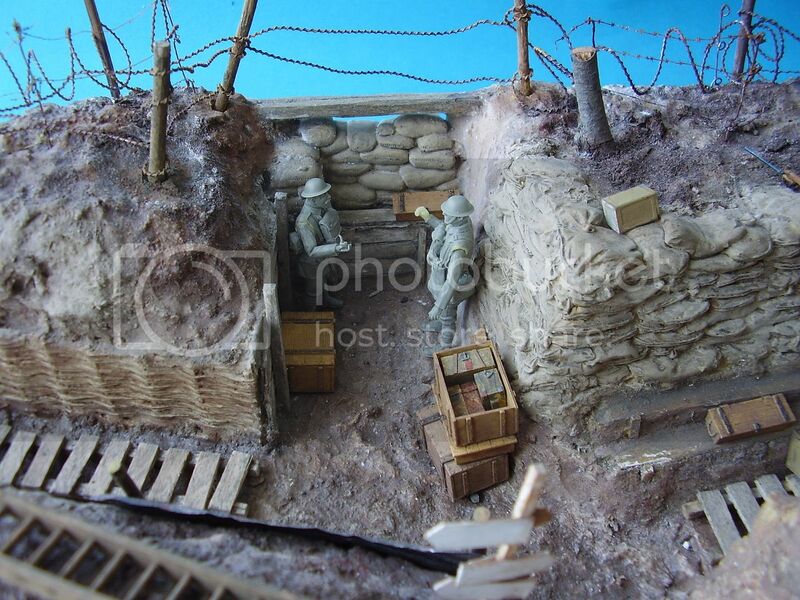 There aren’t that many 1/35th scale WW1 British figures to choose from. MasterClub do have quite an extensive range of other WW1 figures. These were another Duxford purchase as I just happened to spot the MC stand. The Lewis Gun or Lewis Automatic Machine Gun was invented in 1911 by Colonel Issac Newton Lewis of the US Army. Internal difficulties saw him resign and leave for Belgium around 1913 where he established the Armes Automatique Lewis. The gun was adopted/developed by the Armes Automatique Lewis Company in conjunction with the British Army using the British .303 round. The Birmingham Small Arms Company Limited (BSA) purchased a licence to manufacture the gun in 1914 and it was adopted by the British Army under the designation Gun, Lewis .303-Cal and officially approved for service by October 1915. The figures come packed in a sturdy plastic MasterClub box contain the two figures in separate zip bags and a small black and white insert showing a picture of the troops and details of the product. The figures are cast in a grey resin and depict a Lewis Gunner and his Loader in a standing position. Both come on a small plinth which will need removing or not depending on your needs. The figures stand approximately 42mm from heel to shoulder and have good body proportions. The figure comes in 9 Parts. The body cast as a whole, separate head, arms and helmet and the Lewis Gun plus the stand and a drum magazine. The figure is dressed in leather jerkin, trousers and putties with ammo boots. Over the jerkin on the front chest is a respirator and further equipment comes in the form of a leather belt, shoulder straps and 1914 open top pistol holster with pistol handle showing and small ammo pouch. A small haversack is attached to the lower left hand side of the belt and a spade head carrier and water bottle are attached to the lower right hand side of the belt. Missing is any indication of a belt buckle on the front of the belt. There are nice buckles and details on the remaining equipment. The jerkin, trousers and putties all look nicely done with only a little flash to clean up between the legs. I could see no evidence of a seam that needed clean up so that’s a real plus. The ammo boots are also well depicted. The head, arms and helmet are all separate items. The head looks nicely done, and comes with the chin strap attached. The right arm is designed to support the Lewis Gun against the right shoulder whilst the left arm hangs by the soldiers side. There is some flash to be cleaned up on the arms and hands and you need to take care removing the helmet from the pour plug. The Lewis gun looks to be a good representation of the weapon and the magazine, which is also a separate item has nice detailing both top and bottom. There are no build instructions for the figure so I am assuming two of the remaining straights are for the gun legs but not quite sure what the 3rd larger/thicker straight is for. The Ammunition Carrier consists of 5 parts. Again the body as a whole, separate head, arms and helmet. This time the soldier is dressed in a tunic, trousers, putties and ammo boots. The tunic has nice side pockets and looks to be a good representation of the kit. Over the tunic and again worn on the front chest is a respirator and under that a belt and braces supporting 2 x Lewis drum ammo pouches on the front and 2 x Lewis ammo pouches on the rear. There are nice buckles and details on the equipment. This time there is indication of a front fastening for the belt. The face is nicely done and this time sports a fine moustache. There is no chin strap shown so you may need to add this either hanging down or around the helmet rim. The right hand is holding a fine pipe and the left arm appears to rest on the body side. No weapon is provided for the loader, which seems a bit odd. The epilates on the uniform seem a bit large and square looking to my eyes. and paint up well. The poses are not that exciting but facing each other would appear to perhaps be in conversation, but it’s hard to judge from a Black and White photo. There is a little bit of overspill from the pour on the left arm of the loader and under the jerkin of the gunner under the left arms slot. There was a bit of work required on the joints of the arms and some seams to be dealt with on the arms, which look like the result of the pour. It is always good to see more WW1 British Infantry in 1/35 scale. There is no indication of who sculpted them on the box but they have done a fine job. Very nice figures. 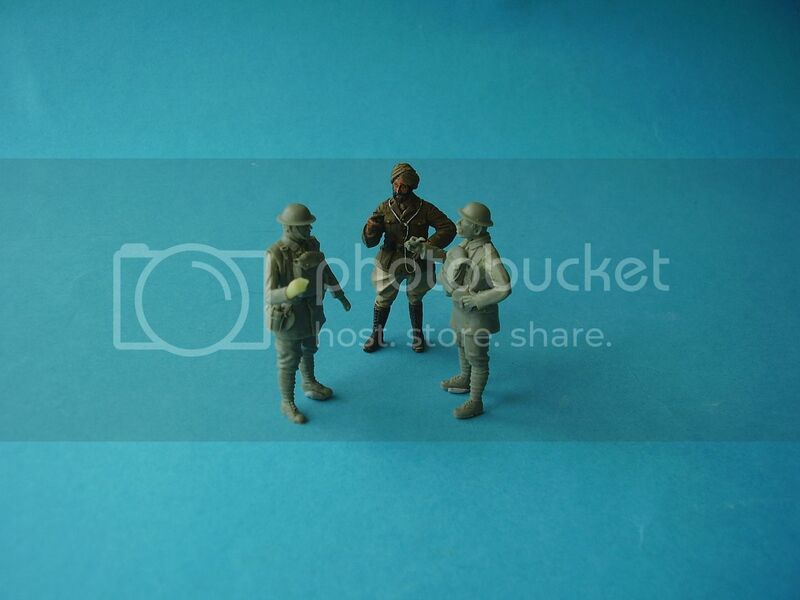 I had no interest in WW1 until I spotted the Tommys War figures and now suddenly have found myself looking for more. Have bought some beautiful figures from the Fusilier but they are also 1/32 or 54mm. As stand alones, the scale doesn´t matter too much, but I can see these in my collection soon! Cheers Alan & Darren. Really nice figures. They'll look right at home in your Somme dio Al "Set up there Smith" -"But its all wet there Corp"- "So is all of bloody France. Shut up and get set up"
I dont intend to make dios in 54mm/1-32 scale .... except small vignette type scenes maybe. Got the TW motorcycle and also the new trench section ... add a figure or two ... and viola, enough. Because all I got so far is in this scale, Im happey confining WW1 to 54mm.